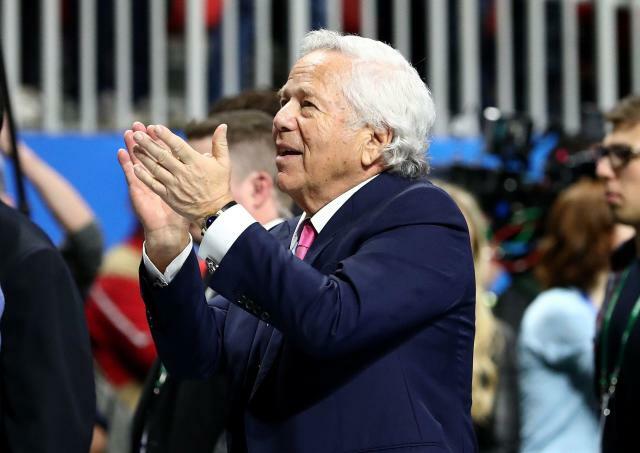 Prosecutors in Florida have reportedly made an offer in the solicitation of prostitution case they brought against New England Patriots owner Robert Kraft. Both of the misdemeanor charges against him will be dropped if he admits that he would have been found guilty had the case gone to trial, according to the Wall Street Journal. Kraft would also have to take an education course on prostitution, complete 100 hours of community service, subject himself to an STD screening test and pay some court costs. Last month, Kraft was among dozens of men charged in the case. Prosecutors allege he visited the Orchids of Asia massage parlor in a Jupiter, Florida, strip mall on Jan. 19 and Jan. 20, 2019. The second visit was on the morning of the AFC championship game. The 77-year-old was charged with two misdemeanors and has thus far entered a plea of not guilty. Other defendants are being offered similar terms, according to the Journal. So now Kraft has a decision. Getting the charges dropped is no doubt appealing, particularly if it increases the likelihood that video of the incidents, which police say exists, never see the light of day and cause further humiliation to all involved. Presumably, getting that sealed and locked away is a high priority. However, agreeing that any proceedings would have resulted in a guilty verdict likely opens Kraft up to punishment from the NFL under its code of conduct. It isn’t the same as admitting guilt, but that is one fine line to walk. The statement doesn’t say Kraft had never visited the massage parlor. Nor does it say that if he did, he just got a legal back rub. It’s why in the court of public opinion, Kraft is guilty and he’ll have to deal with the embarrassment and cackling fans during Patriots road games. But what of the NFL punishment? Goodell delivered a six-game suspension and $500,000 fine, banning Irsay from the Colts facility, games, practices or league functions. He was even prohibited from tweeting about the league. “I have stated on numerous occasions that owners, management personnel and coaches must be held to a higher standard than players,” Goodell said in a statement at the time. So now here is Kraft, who can’t even (or is unlikely to) cite a health issue such as a substance addiction to explain himself. Kraft can begin to put this behind him, but he may be staring at the same NFL penalty, or even longer. That particularly stings because New England will unfurl a sixth Super Bowl banner on opening night in the kind of celebration Kraft, or just about any team owner, has enjoyed in the past. Kraft could also try to negotiate for better terms or even fight the charge and somehow beat the evidence, although a trial where videos are shown would be an improbable strategy. While the case was originally heralded as part of an anti-human trafficking operation, no charges for that crime have been filed. According to police reports, Kraft interacted with the 45-year-old manager of the spa and a 58-year-old employee. That may be one reason why prosecutors are apparently ready to move on. Kraft can start that process, but while the legal issues are his first concern, the NFL is waiting as well. Due to the high-profile nature of this incident, Goodell is in no position to offer leniency to make it all fade away.